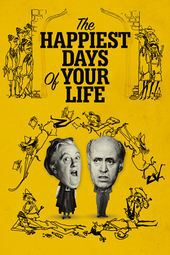 The 1950 film The Happiest Days of Your Life is a finely tuned expression of comedic chaos. Nutbourne College, a stately British boarding school, is the setting for a hysterical battle of the sexes in which opposing headmasters vie for territory and control. The battle appears in illustrated form at the head of the film, behind the credits, drawn by famed English illustrator Ronald Searle. Featuring frenetic and fast-paced music by Russian-born composer Mischa Spolianksy (who later scored Saint Joan), the opening sequence sets the stage for mayhem – it’s just unfortunate that the credits cover up so much of the wonderful detail. Regardless, Searle’s illustrations capture the energy of the film, giving clear indications of the humour and havoc to follow. 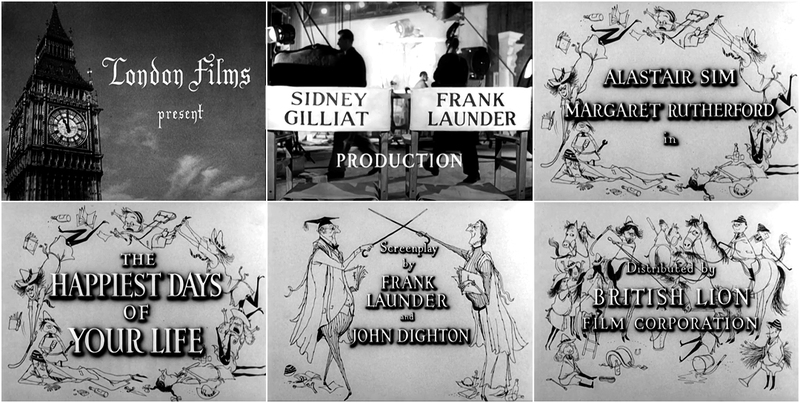 His first foray into feature film title design, Searle’s illustrations also set the stage for a series of collaborations with producers Frank Launder and Sidney Gilliat. Along with Alastair Sim (who stars in The Happiest Days of Your Life), the group would go on to work together on the St. Trinian’s series of films.